Take the flashlight away immediately! 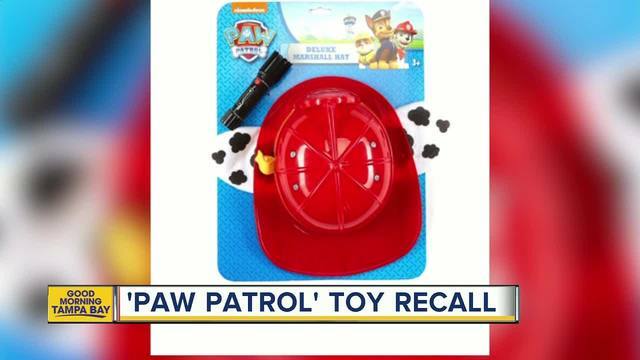 This recall involves the Nickelodeon PAW PATROL Deluxe Marshall Hat sold with an accessory flashlight. 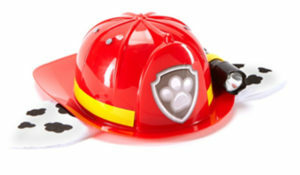 The PAW PATROL Marshall hats are red with a yellow ribbon, black and white spotted dog ears and a black flash light attached to the side of the hat. The flashlight is included with the hat and they share the same SKU number. Only flashlights with SKU 01292093 and date codes 1703RY01, 1603RY01, and 1503RY01 are involved in this recall.The SKU number and date codes are on the sewn in label under the ear on the hat. Sold At Spirit Halloween stores nationwide from September 2015 through November 2017 for about $13. Spirit Halloween toll-free at 866-586-0155 from 9 a.m. to 5:30 p.m. ET Monday through Friday, email at GuestServices@spirithalloween.com or online at http://www.spirithalloween.com/content.jsp?pageName=ProductRecall for more information.